The brain’s ability to communicate with the muscles via neuromuscular junctions maximize the amount of motor units recruited. The mitochondria within muscle tissue are responsible for producing adenosine triphosphate (ATP), the most basic form of energy used in the body. Cross-sectional analysis of muscle tissue reveals that mitochondria respond to training by increasing in density, not by multiplying in number; therefore, the purpose of strength training is to increase mitochondrial density through repeated bouts of strength training demands with adequate recovery between bouts. Muscle Fiber. Digital image. Getphysicaltoday.com. N.p., 14 June 2012. Web. 10 Apr. 2015. Muscles are made up of a series of fascicles that contain muscle fibers. 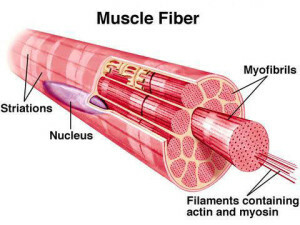 Muscles fibers are made up of myofibrils which contain the muscle filaments that house actin and myosin. Myosin is the anchor. The actin moves up and down the myosin using cross-bridges. If myosin is a stationary log, then think of actin as a centipede, with the cross-bridges being the centipede’s legs. As muscles contract, two centipedes crawl along the log towards each other. When the muscle extends, two centipedes crawl away from each other. This is happening millions of times over inside the muscles during a coordinated lift. Concerning strength training, it is the cross-bridges that play a key role. If you move the weight too quickly so that gravity and momentum are doing the work instead of the muscle, then cross-bridges are being skipped because they are not under tension. In other words, if the centipede legs do not physically walk along the log under tension, than those legs do not get exercised. Even though the muscle may go through the full range of motion, if it is not under equal tension through the full range of motion (due to momentum or gravity), then not all cross-bridges are loaded equally. We want all the legs on the centipede to be strong, not just the first few legs that get the momentum going, or the ones that catch the weight after a brief free-fall due to gravity taking over. Motor units are the combined effort of muscles and central nervous system to facilitate work. Small movements like brushing your teeth recruit few motor units, while a deadlift recruits thousands of motor units throughout the body. Neuromuscular junctions are the spider-web network that attaches the central nervous system (brain communicating through signals via spine and nerves) to the muscles. This spider-web expands with training, allowing better communication to occur with motor units. The more we do a movement, the better our brain gets at communicating with the muscles to do that movement. The heavier the load, or the faster it must be moved, the more demand placed on the central nervous system to recruit more motor units. We have found that heavy weight moved quickly recruits the most motor units. We also know that even though a muscle goes through it’s full range of motion, that cross-bridges can be neglected if momentum and gravity do the work instead of controlled tension on the muscle. The purpose of strength training is to recruit the maximum amount of motor units (heavy load moved quickly) to do the maximal amount of work through the full range of motion (controlled movement to maximize cross-bridge activation). This creates a divide in training philosophy. Some move all weight quickly to recruit the most motor units. Others slow down to make sure that all cross-bridges are loaded equally, with emphasis on the negative phase to maximize the cross-bridge activation. Olympic lifts have become a staple in most strength training programs because they demand the central nervous system to rapidly move large amounts of weight, which recruits the maximal amount of motor units. There is no argument against that fact; however, the downside to using Olympic lifts for the purpose of strength training is that they all incorporate momentum as part of the technique, and most Olympic lifts have no negative phase since weights are simply dropped. This makes them fairly inadequate at providing tension through the full range of motion, sense momentum carries you through the positive phase, and the negative phase is omitted entirely. While maximal motor unit recruitment is desired, tension through the full range of motion should not be sacrificed if the end goal is muscular hypertrophy and strength gains. So here are the nuts and bolts of the A.P.E.X. way of performing a perfect rep for the purpose of strength training. I understand that there are varying opinions on this, and I do not discredit any other profession stance on the issue. But for our purposes, we build programs around large multi-joint movements that include both a positive and negative phase (i.e. incline bench press, deadlifts, pull-ups, squats, etc). To elicit maximal motor unit recruitment out of these lifts, we recommend moving the weight as fast as you can during the positive phase without generating momentum. The positive phase should take roughly one second to complete. During the negative phase, we have found that without significantly hindering the total reps completed, we can get away with a three second negative phase to maximize the cross-bridge time under tension. Any longer than three seconds and it seems to hurt the total reps completed, and faster than three and gravity is helping. If I am squatting 315 lbs and my explosive positive takes one second, and my negative phase also takes one second, and I perform 10 reps, I have effectively done 20 seconds of work (and a great job of stimulating my CNS). If I take that same 315 lbs and use the same explosive positive technique of one second, but instead of dropping with gravity and skipping the majority of the cross-bridges, I lower the weight deliberately and under control for three seconds, we will still be able to perform the original 10 reps without a performance reduction and will be effectively doubling our time under tension to 40 seconds of work. Stronger centipedes, each and every tiny leg. This adds up through the course of a set, a workout, a program, with the desired physiological adaptations of strength and hypertrophy.